Check out the sidebar for upcoming events and ways to connect with us! Not a WITS event, but most of the same great instructors will be there! Wilderness Introduction, Training, & Survival Outdoors! 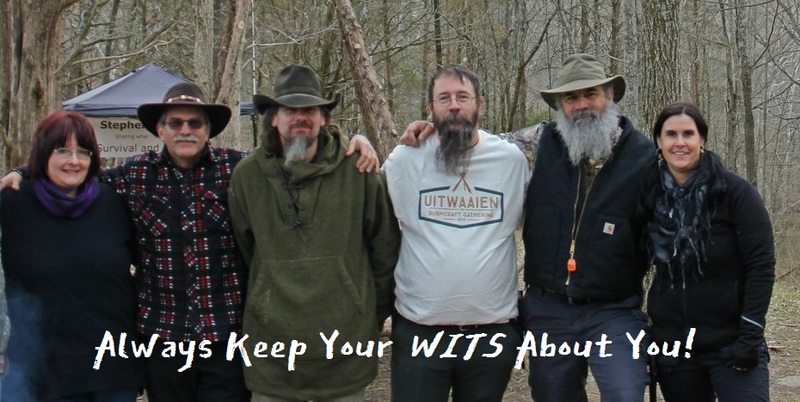 WITS Outdoors is a group of instructors who have known each other for years. We decided to join forces and do survival and wilderness skills trainings across the country, starting on the east coast! At a WITS Outdoors' event you will get high quality training in a friendly, relaxed atmosphere. Not only do you not need any previous skills or experience, but at a WITS Outdoors event you don't even need to bring any equipment, other than a fixed blade knife! When you attend a WITS Outdoors training event you will not only leave with the skills you need to enjoy the outdoors, but all the gear you need to carry too! Included in your ticket price is a pack chock full of outdoor gear that you'll use during the training and then take home with you! Everyone goes home a winner at a WITS Outdoors event! but it will always be a great set of tools to enjoy the outdoors! We hope in the future to continue to add new and exciting destinations to our list of training locations. Check out our Events page and find out more about the scheduled training weekends we hold. Has your group or organization been looking for quality outdoor skills training? Look no further! WITS Outdoors' instructors have a wide variety of backgrounds and experiences in wilderness and survival skills. Get in contact with us; we may be able to come to you! Coming Soon, WITS Outdoors Advanced Training Class! Ready to step it up a notch? Well, so are we! The instructors here at WITS Outdoors know that you want to keep getting better, learning new skills, and advancing towards your outdoor/survival goals. We're here to help you reach those goals! Coming soon, the WITS Outdoors advanced training class. Make sure to follow us on Facebook and keep an eye out here for more info! In the meantime, check out our basic class offerings!